The sands of Egypt, 50 BC. The pyramids are crumbling, the temples are in ruins,and even the nose of the Great Sphinx looks like it might fall off any day now. Cleopatra is one unhappy queen! Now she has called on the members of the Society of Architects to build a magnificent palace in Alexandria. Work has started in earnest, and the competition promises to be intense. On any given day, you might be found scouring the markets in search of Resources worthy of a Queen or tirelessly working your crew in the Quarry. Some of your brethren have been making rather inexplicable progress, coming up with goods faster than humanly possible, and erecting new pieces of the Palace at breakneck speed. Rumors of midnight meetings and secret, forbidden rituals have been spreading. Now, amulets and hieroglyphs honoring Sobek, the Crocodile-god, are appearing in the strangest places. Corrupt officials and building materials of dubious origin may help you stay ahead, but beware: the price of corruption is sure to be high! Will temptation drive you to the worshipers of Sobek, and to a violent end in the belly of Cleopatra's favorite pet? 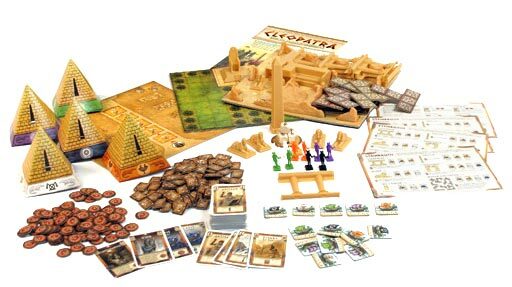 Or will you survive to become the chief architect of the Kingdom - and win the great riches offered by the Queen? The rules booklet had a good inventory of parts, but was a little unclear about set-up. Otherwise, all was well described and easy to find for later reference. As with most games of this complexity, a few rounds and we were running along fairly well. The thing with the ankh dice and the offerings was a little odd. Fit the theme, but didn’t flow so well with the rest of the play. The resource management, construction, characters, and corruption all worked very well. The pentominoes to build the courtyard area also seemed a bit contrived, a separate game idea that was not too well integrated with the rest. In the end – we had fun with it, and might bring it out again someday, but I don’t see it being high on anyone’s wish list. If the components were less “toy-like” it might help. All those plastic bits seemed to cheapen it for us. It looks more like a mass-market game, but far too much game for a mass market audience. Conclusion: I’d give it another try, but I’d rather play 7 Wonders. 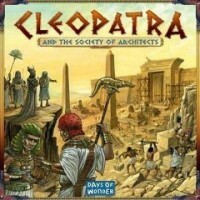 Add a Review for "Cleopatra and the Society of Architects"